I’m happy to share my new friend Eva Pasco‘s work with you. I hope you enjoy finding new authors and books as much as I do. Eva Pasco is the author of acclaimed Contemporary Fiction novel, An Enlightening Quiche, which has merited a Readers’ Favorite 5-Star Seal, ranks 1st out of 78 books set in Rhode Island (Goodreads Listopia), and is a 2017 ATAI Fiction Finalist. Eva became a proficient typist at the age of nine, courtesy of her mother. Thrills from the spill of words on a blank page occurred during adolescence, sparked by a malfunction in the electrical wiring which caused a doorbell to ring automatically. The bizarre incident prompted a budding author to compose, on her girlie pink Tom Thumb typewriter, “The Mystery of the Midnight Doorbell”—a short story involving secret codes and a smuggling ring! Having composed several short stories and a Romance novella, the rigors of college and a teaching career shelved further creative writing ambitions until retirement. Then, midlife restlessness reactivated Eva’s dormant flair for writing. As a result of that revival, she has published two books—her most recent, An Enlightening Quiche. Eva credits Anne Lamott for the heartbeat of her writing which incorporates secrets, quirkiness, and spiritual transformations. Eva’s novels are character-driven by flawed female protagonists who grapple with, confront, and overcome their personal dilemmas by empowering themselves to make profound life changes for the better. Written primarily for women over forty, her plots and themes are infused with realism befitting this age bracket. A native Rhode Islander, Eva interweaves elements of historic landmarks, geographic entities, and regional culture as they pertain to the novel. Besides pounding the keys writing memoirs or blogs in-between novels—Eva enjoys reading, solving challenging crossword puzzles, and walking along the shore. Augusta: I sprawled provocatively on the sofa and leaned back against overstuffed fringed pillows, a temptress in waiting. For a factory Gal Friday, my surroundings were none too shabby thanks to the largesse of a lothario. Replicated Baroque grandeur prevailed: hand-carved mahogany, gilded trinkets, ball-and-claw foot, winged griffins, and velvet opulence in shades of burgundy trickled from the parlor to the boudoir like spilled wine. Yet, I was partial only to the elongated, leather keepsake box I’d scored at Lorraine’s yard sale last October, a false lull of normalcy before an Iraqi bullet struck her son dead two months later. Its bed lining simulated a much more suitable coffin to lay my mother’s effects to rest than Tante’s nondescript shoebox. No doubt about it, the somberness of Louis XIV’s Versailles Revival suited my dark side, heretofore devoid of taking the high road along beau chemins. The doorknob turned, prefacing his stride across the room. Boyish good looks and mannerisms belied the dysfunctional poseur hiding beneath a charming exterior. The tinge of his breath suggested he may have had a belt or two to blunt the edge of an illicit rendezvous precipitated and sustained by desperation. I sat up, ready for him to kneel at my feet and bury his face in my lap while he shed tears coursing from feelings of inadequacy. And, as of late, consumed with anxiety and gripped in its paralysis. I stroked his waves, knowing full well the gesture groomed a merge between two people fraught with human frailties. 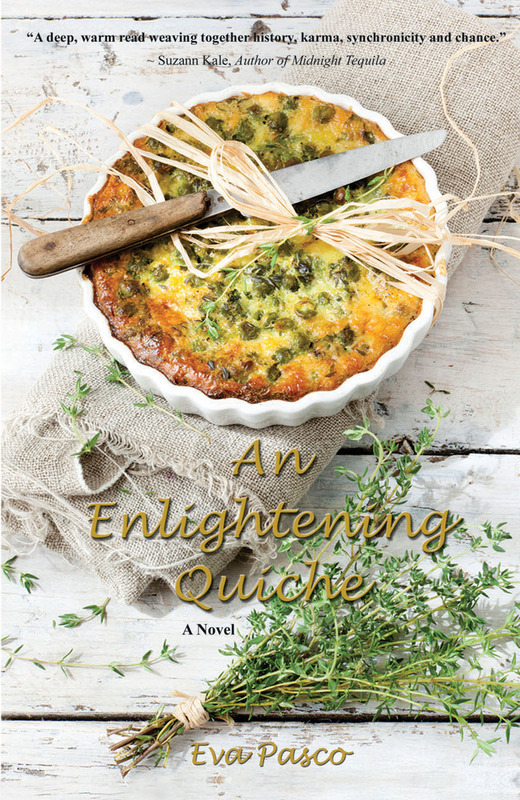 AN ENLIGHTENING QUICHE is available on Amazon and Barnes & Noble. You can follow Eva on Goodreads, Facebook, and Author’s Den.